The dynamic interaction of vehicles and bridges results in live loads being induced into bridges that are greater than the vehicle’s static weight. 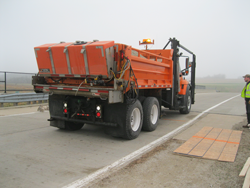 To limit this dynamic effect, the Iowa Department of Transportation (DOT) currently requires that permitted trucks slow to five miles per hour and span the roadway centerline when crossing bridges. However, this practice has other negative consequences such as the potential for crashes, impracticality for bridges with high traffic volumes, and higher fuel consumption. The main objective of this work was to provide information and guidance on the allowable speeds for permitted vehicles and loads on bridges. The DIF increases with the increase of truck speed, entrance condition level, and bridge span length. For all investigated bridges under Level 1 and Level 2 entrance conditions, the DIFs exceeded 0.3; under the As-is entrance condition, the DIFs were less than 0.3 for the steel and concrete girder bridges and less than 0.1 for the concrete slab bridges. The empty dump truck induced the greatest impact factors, followed by the full dump truck and then the semi-truck. To limit the DIF to no more than 0.1, for all bridge types, the allowable truck speeds are 30 mph for As-is entrance conditions and crawl for bridges with Level 1 and Level 2 entrance conditions. The researchers recommend that currently collected road roughness information be examined for use as an indicator of entrance condition. If successful, the international roughness index (IRI) data could then be used to determine the speed limitation to put in place as well as which DIF values to use in permitting analysis. Furthermore, the long-term bridge monitoring systems installed on Interstate 80 should be used to study impact factors and stress levels for actual permitted vehicles. Utilizing these data will provide the best information as to what level permitted vehicles traveling at highway speeds induce dynamic effects in bridges.